Source: William Hone, The Every Day Book, 2 Vols. London: William Tegg, 1825, 1827 (Volume 1, 1825, December 25). 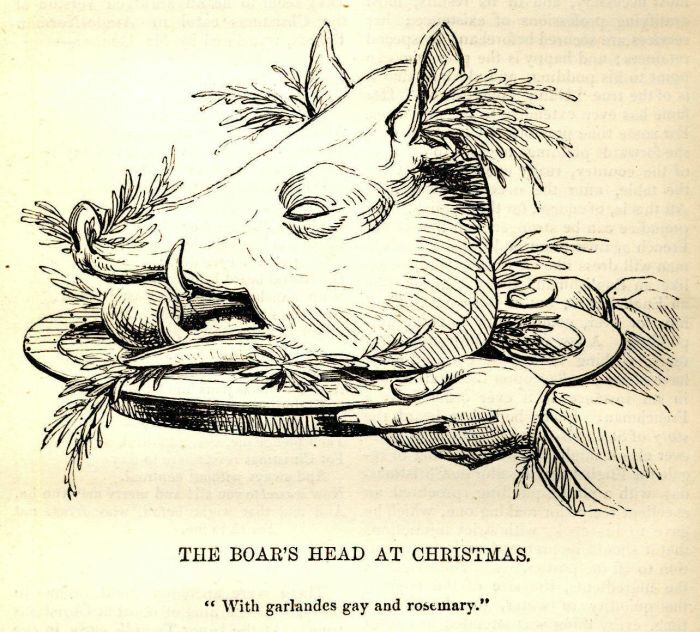 With our forefathers a soused boar's head was borne to the principal table in the hall with great state and solemnity, as the first dish on Christmas-day. In the book of "Christmasse Carolles" printed by Wynkyn de Worde in 1521, are the words sung at this "chefe servyce," or on bringing in this the boar's head, with great ceremony, as the first dish: it is in the next column. A CAROL bryngyng in the Boar's Head. Is the chefe servyce in this lande. 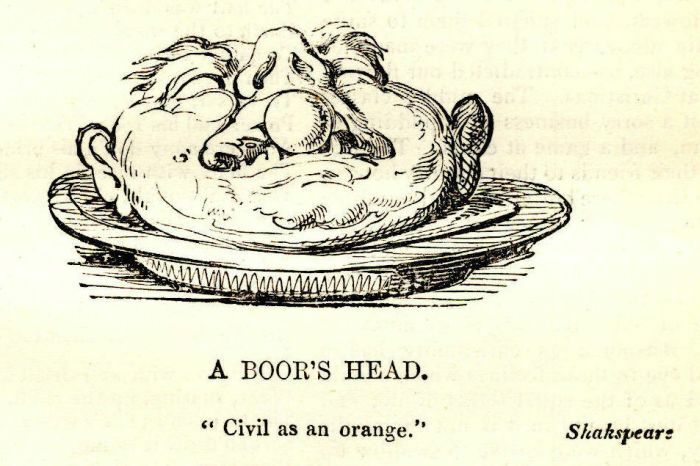 The bore's head with mustarde. The Boar's Head at Christmas. "With garlandes gay and rosemary." Warton says, "This carol, yet with many innovations, is retained at Queen's-college, in Oxford." It is still sung in that college, somewhat altered, "to the common chant of the prose version of the psalms in cathedrals;" so, however, the rev. Mr. Dibdin says, as mentioned before. In "The Wonderful Yeare, 1603," Dekker speaks of persons apprehensive of catching the plague, and says, "they went (most bitterly) miching and muffled up and down, with rue and wormwood stuft into their eares and nosthrils, looking like so many bores heads stuck with branches of rosemary, to be served in for brawne at Christmas." An engraving from a clever drawing by Rowlandson, in the possession of the editor of the Every-Day Book, may gracefully close this article. Mr. Ritson, in his Observations on Warton’s History of English Poetry, give the following from a MS.
Tydyng’ gode y thyngke to telle. See also Ritson's Ancient Songs.